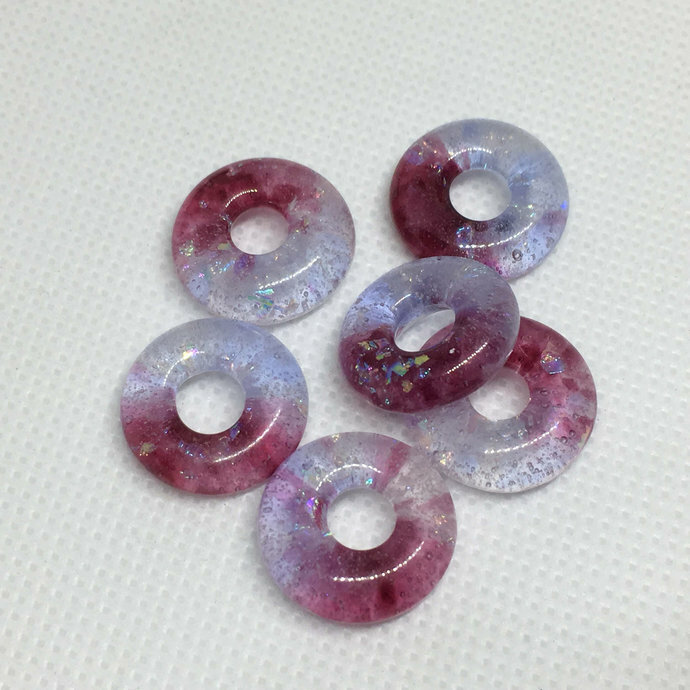 Handmade Fused Glass Donut Beads in Dichroic Cranberry Pink and Lavender - Create your own DIY Jewelry with sparkly Dichroic glass and pink glass. They make great Handmade Jewelry Supplies for Wedding Jewelry. Made with actual gold, these handcrafted Jewelry Supplies are perfect to make your own Wedding and Designer Jewelry super special. Choose Round or Square beads. These beads are Made to Order - expected to ship within 3-4 business days, depending on the quantity that you order. They are created by layering clear glass frit with small bits of multi-colored frit glass into a mold to create a sparkly gradient effect, and then melting to 1425 degrees in a glass kiln. Handmade beads make your designs special and unique. They are great to use in a necklace, pendant, earrings or other crafty creation. Place them on a beautiful ribbon and it will make a perfect unique gift for anyone.They are silky and smooth to the touch on one side and delicately textured on the other side...great for use as a tactile meditation tool to counteract any worries. Great for your jewelry making: wire-wrapping, necklaces, pendants, earrings and crafts! Want matching beads? If you make a purchase of $10 or more in cabochons, receive a discount of $2 for a set of lifesaver beads (use code CABCOMBO). Looking for more handcrafted jewelry supplies for your Jewelry or other crafts? Gift Certificates are also available in any denomination - Please contact me to request one. Kiln annealed for strength and durability, but, it is still fragile if dropped on a hard surface. All of my creations are my original designs and are individually handcrafted by me. The handmade quality and creativity are what set my work apart from mass-produced products. Color, size, and texture variations contribute to the uniqueness of each piece. UNLOCK your first Coupon Code when you subscribe to my mailing list/newsletter! I love seeing how you use my beads in your own jewelry creations. Please feel free to share a photo of your purchase in use, on Instagram and tag me @sycamorecindi and @cyvonneh-on-etsy. You can also check out my Instant Download Digital Clip Art at https://www.etsy.com/shop/FishboneArtClips.